Dave Jones saluted his players for a “magnificent” away performance to move Hartlepool United closer to Football League safety. Pools stand nine points clear of the relegation zone after Michael Woods scored a well-taken winner at Cambridge United last night. Jones’s side moved up to 20th courtesy of the 1-0 success at the Abbey Stadium - their third victory in the last four games. Now the Pools boss wants to see his players follow up the triumph with another against Wycombe at the Northern Gas & Power Stadium this Saturday. “It’s important we have no dip after this,” he said. “Nine points from 12 is a good return - it probably should have been 10 from 12 . “We know we still have a lot of work in front of us. “That was a great three points but we have to keep it going. Woods struck the winner in the 63rd minute after some lovely play between Lewis Alessandra and Padraig Amond. It was the first away victory since October 1 and ended a run of six straight defeats on the road, five under Jones. And the boss said he was delighted to see the team get the proverbial monkey off their back. “We’ve had some good performances away from home without getting any rewards,” he said. “Now we’ve had a good performance and the result. “The players have been working hard and listening and they’ve deserved that. “It was important we got something. “I’d have been happy with a point, but the more the game went on they ran out of ideas and we dealt with everything they threw at us. “Every one of them was absolutely magnificent. They gave their all. “I’ve said this many times that technically they are very good, it’s the other side they’ve needed to do and they’ve done that. “We’ve said that it’s about time that we stood our ground, man for man. 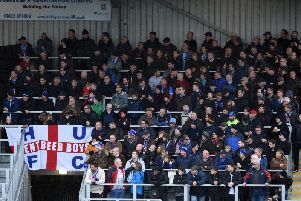 Jones dedicated the victory to the 102 supporters who made the long trip down the A1. “I can’t praise them enough,” he said. “Everywhere we go is a long trip and they really put in the miles.